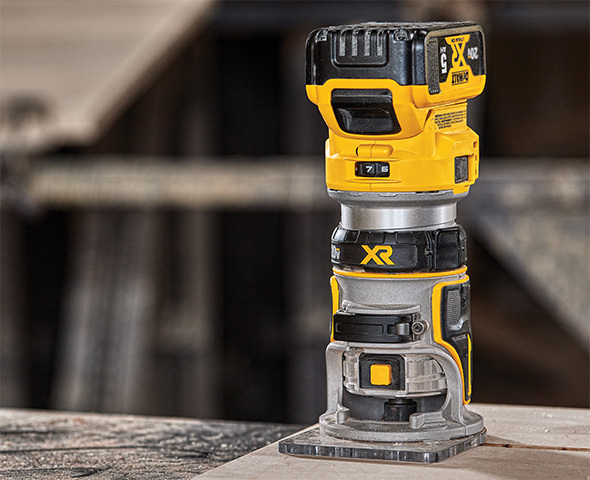 Dewalt is expanding their line of 20V Max cordless brushless woodworking power tools with several new offerings – a trim router, a sander, and both top-handle and barrel grip jigsaws. 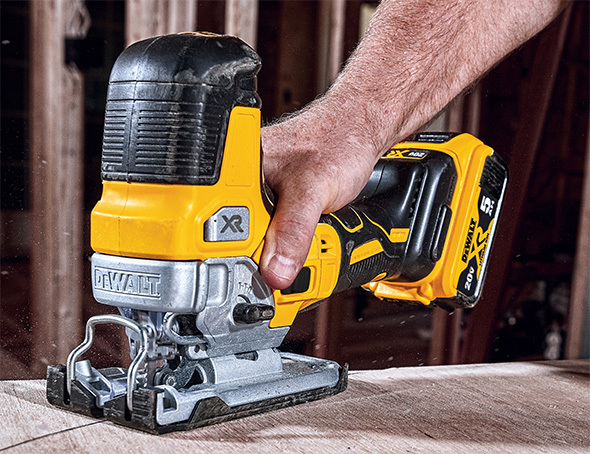 Dewalt says that their new cordless woodworking tools are aimed at professional cabinet makers and installers, trim carpenters, builders and remodelers, residential painters, furniture makers, and general contractors. 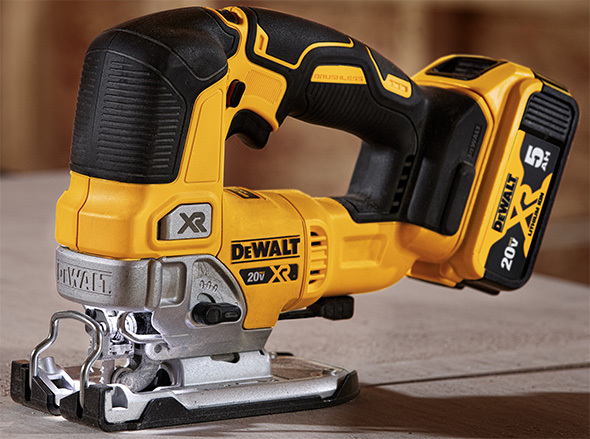 The new Dewalt DCW600 cordless trim router has an all-metal motor, for jobsite durability, electronic variable speed motor, soft-start feature, and electronic brake. There are dual LEDs to help illuminate dark work areas, an adjustable quick release clamp, quick release tabs for base removal, a depth adjust ring, and a spindle-lock button (for easier one-wrench bit changes). The router come switch a D-shaped base for edge profiling and radius referencing. It’s also said to be plunge base-compatible. From the photo, it looks to be compatible with the DNP612 base that works with Dewalt’s compact trim routers. We talked about the Dewalt DCS334 top-handle jigsaw previously, but here’s a refresher. It features a 1″ cutting stroke length, 4-position orbital action, keyless lever-actuated blade release, keyless bevel change, LED worklight, non-marring plastic shoe cover, and an integrated dust blower. Additionally, there will also be a cordless jigsaw with barrel grip. Its features will be similar to the top-handle model, but with a barrel grip and side-mounted on/off switch. 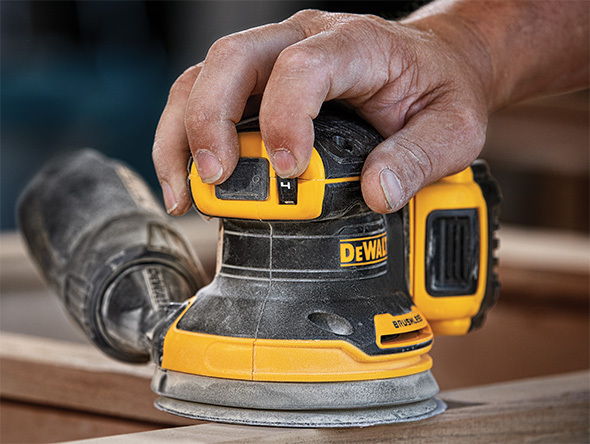 Lastly, there will be a new cordless 5″ random orbit sander, with 8-hole hook & loop sanding pad, easy-to-reach speed dial, sealed switch, and one-handed locking dust bag with AirLock connection that fits directly to Dewalt DWV010 and DWV012 dust collectors. Full specs aren’t available yet, and I’ll update the post when they are. 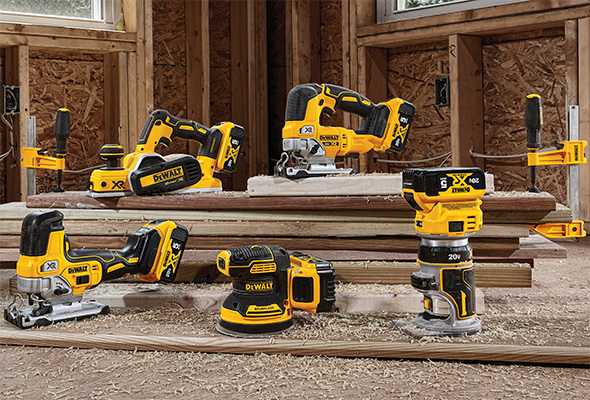 All of the new offerings are definitely welcome additions to Dewalt’s cordless power tool lineup. There’s nothing game-changing about any of the offerings, meaning there aren’t any new surprising features or design elements, but that also means there’s nothing very “risky” about them either. 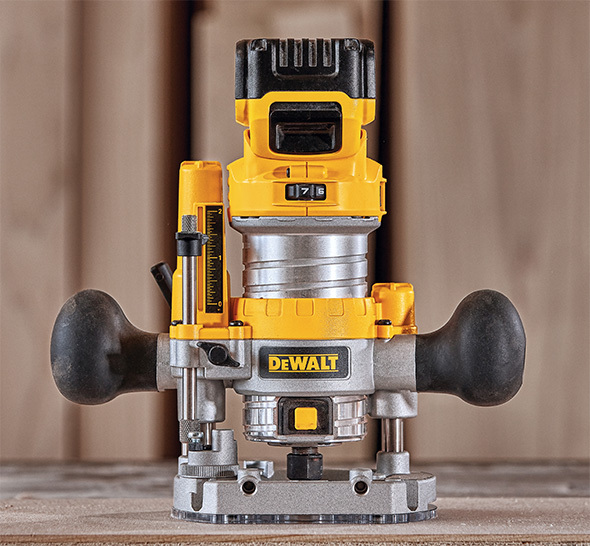 I like that the new Dewalt cordless router looks to be compatible with their compact router plunge base. The sander has a Dewalt AirLock dust port, which means you’ll need an adapter, possibly the DWV9000 which sells for $17 at Amazon, if you want to connect a dust extractor or shop vacuum hose instead of using the included dust bag or specific Dewalt extractor. If so, that would be a minor annoyance. Of the new offerings, I think I’m most excited about the cordless router first, the jigsaws tied for second (I might be a little more excited about the barrel grip version), and the sander third. As someone with a small shop I would like to see more of an emphasis on dust collection on cordless routers and jigsaws. I am not invested in Dewalt and that seemingly simple detail will probably keep me away as I look to upgrade within the next year. Unfortunately, we’re in the minority. Here is the link for the catalogue, I think it is DeWALT Finland website but the catalogue is in English. Doesn’t the need for dust collection somewhat obviate the value of cordless? If you are hooked up to a vacuum line anyway, why undershoot power with a cordless router? more or less my thoughts – why bother being cordless if you’re still draging the dust extraction hose. If you’re going to have the hoses – run the power line down the hose and make it connect in place. Sort of like the old electrolux vacuum power heads. But I now have to ask another question – cordless or corded – which jig saw on the market today has dust collection as an option. I assume there might be a festool product at some exorbitant price. I can’t think of any others. Yes, to the question of Festool – and that of function, not finance. Though, yes, again, their products cost more. I also find as they present “planned systems”, the incorporation of numerous accessories relieves me from , “Oh, if only I had the….” Or, fine… buy yellow. It’s up to each of us. All Bosch jigsaws offer dust collection. Milwaukee Fuel 18v jigsaw comes with dust collection nozzle, Makita jigsaws offer dust collection attachments, Hilti jigsaws offer dust collection, the upcoming Ridgid jigsaw offers dust collection, the currect DeWalt jigsaw offers dust collection adapter in Europe. just worrying about a dust collection hose and no cord makes things simpler and a lot easier on jobsites. Bosch’s 18V cordless jig saw doesn’t show it accepts the vac attachment piece and mentions an always on cut line blower. The 12v barrel grip device doesn’t show it accepts the vac attachment either. So in the realm of cordless jig saws I’m still not finding one that does dust collection. Corded – absolutely. The picture is the Canadian version of the XVJ01. The running the power cord down the hose only works if you are only using one tool, which happens, but not often, or if you are using Festool as they have a proprietary “Plug It” end on their cords that are pretty universal, but use the heavy gauge one if you are switching between, say, a sander and jigsaw then to a TS or HK saw. I suppose another option would be to chop your tool cord down and put a male plug or something. Cordless tools, especially when you are using several tools in the same vicinity, REALLY cut down clutter and make the work area safer and easier to navigate and move stock, tools, etc. I try to keep the vacuum ports on all my cordless handheld tools the same via adapters so I can use the same hose and just switch it between them. I also use a remote control power receptacle and keep the remote on the work table or secured to the end of the vac hose. As for using “underpowered” cordless tools, my Makita 18v compact router has more power then my 1hp Bosch Colt, and its quieter. Next to the cordless track saw, the cordless compact router is the best tool to not have a cord attached to it (not counting drills and impact drivers as they are a given) especially when doing edge profiling or laminate. The Makita router also has a dust shroud with vacuum port that works exceptionally well. Sure, I’ll buy about 80% of that. Especially for things like a drill / driver, the 18v brushless stuff is kind of nuts. I’m a little annoyed with myself for having not looked into them sooner when I bought my (perfectly fine, mind you) corded 1″ SDS and 1/2″ impact. Specifically with respect to a router AND in a small shop though, which was originally the comment so a bit of a tighter scope, you can get a heck of a lot more router power than a Colt. Jobsite is different, I do get that. I spent enough time working for family on house builds to appreciate less cords all over the bloody place. Aside from field use, unless someone comes up with a 3 hp cordless router that doesn’t require a back brace, it doesn’t seem like a tool that deserves the battery treatment from a shop perspective. I have the Makita cordless, the Colt 1hp (mothballed since the Makita joined) and Milwaukee 2.25hp and of course the Milwaukee will do things you can’t, or at least shouldn’t do with a compact router. If I had to only have one router, it would absolutely be a corded ~2.25hp with fixed base in a table and plunge base for everything else. I will say, however, that the Makita does the vast majority of the routing I do, but I’m not building hardwood furniture with finger joints or anything like that. I took a video of the Makita cutting a 3/4″w 1/2″d dado in some Maple a while back and I think this demonstrates its capabilities pretty well. You may want to use Makita DVC260Z cordless back pack vacuum cleaner with it or a DeWALT version if DeWALT makes one! For a router is not needed that much if you work with natural wood like Oak or Pine, but for MDF or Plywood is necessary, the same with a Jigsaw, but that is extremely important with a sander. Both the jigsaws look overly rear-end heavy with the battery. It seems like the motor would need to be pretty robust on its own to not always want to tilt back. Nice release of tools though. They aren’t rear heavy at all, they are very nicely balanced. In fact, with a 5ah battery it is just slightly front weight biased. The extra length does add to the ability for precision control and fine adjustment, without holding it I wouldn’t expect it to be rear heavy as it’s balancing on its own with a decent sized battery in the provided images. I do see the longer handle on the barrel grip as a nice advantage though! I think i prefer the top handle jig saw since it has more than an on-off switch. I bought a Ridgid jig saw and find I really hate a tool with the on-off switch. The saw is fine but i think a full trigger gives more control. The Barrel grip jig saw supposedly has a dial speed control – so it’s like the Bosch competitor. In fact if they did it right – and maybe they did – it will act very much like the bosch or makita competitors with more cutting torque. People have been commenting on the sideways configuration of the battery on the sander. In the 2nd sander picture, it looks as if it’s giving a lower profile grip than the Milwaukee. THe router looks a tad bit to tall. Top heavy almost. Especially if you were to use a large capacity battery with it. I’m most excited about the D handle jigsaw and the sander. well it’s interesting there are Black and decker and porter cable branded cordless single speed 5 inch sanders also and they have a vertical battery setup. So I can see why it’s odd the dewalt is sideways. I sort of wonder if it has more to do with the vibration and sizes of the batteries. The dewalt battery system has much larger batteries than the PC or BD systems have so it might have been repositioned due to battery size. 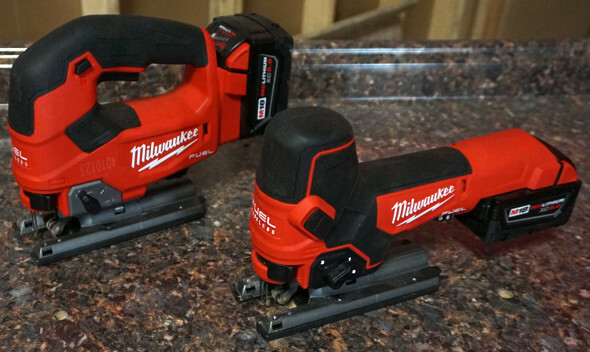 The horizontal battery allows you to grip the sander like a traditional corded sander. It is very comfortable to use. I noticed you didn’t mention the planer – or is that not new also. I’m not that interested in it but looks nice. Of the items I’m most interested in the barrel grip jig – mostly to put hands on it and see if I like it. I’m leaning towards a corded bosch at the moment. Second is probably the sander – I’m in the market for one and while I’m probably just going to buy a corded – for a variable speed sander the price isn’t that unreasonable. Bare too that is – I have dewalt batteries. I’ve little interest in the palm router but I’m glad they make one – hope it compares favorably as it looks like it’s a good use case. DO you think they will make some flexvolt cordless devices to go with these. IE like a flexvolt Standard size router – or a flexvolt belt sander or RO polisher/sander. etc etc. The brushless planer has been out for over a year. It is an excellent planer. Focused on large commercial buildings, Which I highly doubt a router would be needed on. A lot of the flexvolt advertisements I’ve seen they’re working with concrete and steel anyway. I figure since they have the mitre saw and table saw both work work/ construction tools I wonder if they will make others like them. THey make a flexvolt grinder now – I can see them making a flexvolt polisher/RO sander kit. The body and Motor exist should be an easy sell. as far as the router – who knows there seems to be a market need for a cordless compact router why not a cordless full size router? They already make the flexvolt table saw and mitre saw. A flexvolt router would be great tool to cut out window openings. I think there is a big market for it. Chris, wrong… flexvolt is for anyone would cuts wood. Usually used by remodelers and residential home construction…as I do. Large commercial jobs use Hilti tools, which are geared more for steel and concrete work..
My only question, which probably only the corporate shmucks at HQ could answer is, “WHY DID IT TAKE SO LONG?? ?” And why do we still have to wait? They’ve led the market in some areas but when it came to Brad/finish nailers, trim routers, Sanders, etc. They have just shrugged off the demand for it. Especially the router. Which is super weird because DeWalt has been a carpentry centric company for a long time. Oh well, this might be a few years late but at least they finally did it. I feel like the sander would be hard to use since the battery is hanging off the side like a window ac unit. You cant fully palm it cuz the battery is in the way, and the lopsided weight will want to dig in on one side more when sanding. I cant wait to get a feel for these in store though. Im already invested into dewalt so waiting for a cordless router and sander for years now. I wonder how much better the xr jigsaw is over the older non xr? I don’t think it is any accident SBDC threw these announcements out there. There has been a lot of beefing about no announcements or news for quite some time for DeWalt. And it is obvious the Craftsman relaunch was taking the lion’s share of attention. I think they wanted to get this out there for the guys who were saying; Where’s the pros stuff? And team Red has been full on with new releases and making some huge inroads into woodworking tools. As others have mentioned, it used to be the big M was plumbing and electrical oriented. Woodworking was a distant thought. Not anymore. I also think this will be the final nail in the coffin for Porter-Cable. Some of us old Luddites were kind of hoping to may be see that brand moved back into pro quality woodworking power tools. But it is plain SBDC has sealed DeWalt for that market and little surprise there. If P-C is still around next year I think it would have to be somewhat upscale bench top tools of better than average quality and some marketing emphasis. A truly niche market. I do wonder if SBDC will transition all the DeWalt 20v max stuff to brushless? I would emphasize it if it were me. But hey, I don’t exactly run SBDC. I know most of these companies kind of like their older brushed models for the holiday sales models. The kind the wife buys hubby because; gee, look! A DeWalt for $99. If they can sell several tens of thousands of these in one big lot to Home Depot and Amazon they make their money back almost up front. In the meantime, I do like it that most of these manufacturers are starting to ramp up brushless introductions for more than drills and impacts. It would almost make sense if they were to setup dewalt to be the cordless pro power tool arm and then setup PC to be the pro corded tool arm. IE so here’s the new flexvolt mitre saw . . . . – — here’s the new PC 12 inch sliding dual bevel mitre saw. In essence the same body, mechanism, etc – but plug in power only with an AC motor on it. So I guess it’s well past the time for me to put the last nail in the coffin of my Dewalt 12v Max tools. It was well past time for that hope 5 years ago. Stuart, with the Dewalt DCW210, what is the COO? Spoke to several “authorized” Dewalt distributors and they weren’t able to claim if this was part of the Made in USA of global materials or imported. One might think a cordless sander might not be that useful and I’d probably agree several years ago. Yet now Dewalt has a 9 mAh battery and soon to launch a 12 mAh battery, so that statement doesn’t hold as much weight as this did years ago. Naturally ANYTHING that is plugged in will work for hours on end. 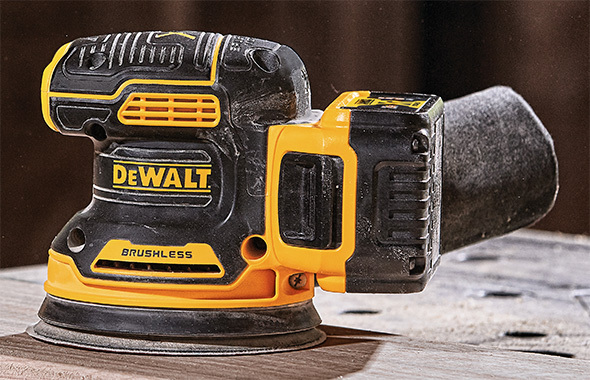 Perhaps a cordless belt sander is next from Dewalt? It’s probably imported. I can double check if you ask, but I’m at least 98% certain it’s made overseas. I would wonder about the weight distribution on the sander. I’d imagine RO sanders have to have the weight centered over the pad to allow them to work well. Is that possible with the battery mounted way off to the side? Weight distribution is good. Yes the battery does put a bit of extra weight on that side, but because the battery is mounted horizontally you can get your hand on top of the sander and centered over the pad so you can easily keep the weight centered. It’s a very comfortable tool to use. Finally! The sander is brushless and the router is brushless. Straight out brushless. In regards to the sander battery placement, turning it “backwards” has the same result in terms to gripping it. So I have no issues with that. Can’t expect to hold it by the battery. Dust bag seems to be the same as corded version. I assume it will work with their existing proprietary attachments. They could have come up with a secondary base plate that had an inefficient dust collection attachment design that everyone would complain about. So I assume they went basic to keep costs down. Somebody design and 3D print one. Wonder if they will have a special kit that comes with the plunger base bundled? The jigsaws do look rear heavy, but I’m sure a compact 3Ahr pack would last long enough for most. If not, use multiple packs. No, the jigsaws are not rear heavy. I called DeWALT UK and they said the Sander and Router will not be available in the UK, it seems like the wall scanner they are just for the US and Canadian market. W just get the Jigsaws here, both Jigsaws are with variable speed, not just the barrel grip one. Side: I’ve only seen one version of a cordless plate (biscuit) joiner. It’s time for other mainstream manufactures to come out with cordless brushless versions. I can only assume that’s what’s next on the list after this. Makita has one and DeWALT was making 14V and 18V cordless biscuit joiners before, they were made in US, rarely you can find the second hand ones online, I have some photos of them if you want to see. Comparing Dewalt’s new router to Makita’s BL router in price, I’m wondering if the Dewalt offers any performance advantage. The Makita router is $129 ($50 less) and has a well established line of accessories. I like that Dewalt is releasing a BL jigsaw with a true variable trigger. I do hope that the bevel lock has been improved over the older brushed model. That alone prevented me from buying that tool. If you set the bevel at anything but zero, the friction lock does nothing to hold it. You can use your fingers to easily change the angle. HOPEFULLY Dewalt has improved that lock lever. And too bad they didn’t integrate a clever dust control design, like Milwaukee did on their new BL jigsaw. Come on Dewalt! Your “new” tools don’t seem to match up to your competitors current models. You should try to beat your competitors…if not in performance and design, then at least in price. I missed “when they will be available” did it say anywhere? I’ve been fighting cords while sanding for decades… its time.